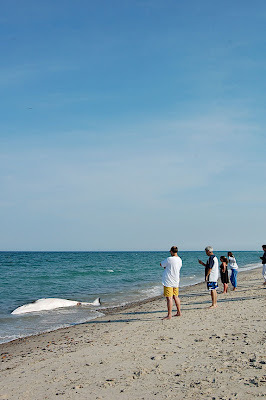 On Saturday at Nauset public we noticed something floating in the water about 100 yards off shore. 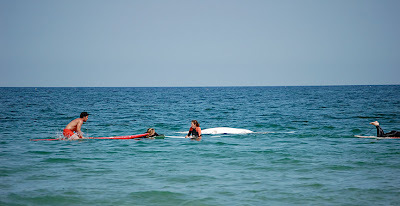 At first I looked like a capsized boat, but when the lifeguards paddled out to it, avoided it, and told the surfer to get away, we figured it must be a whale. It eventually beached and I got a some shots of it. It definitely had a few good bites taken out of it - which always helps the surfer's psyche the next time he gets in the water (won't tell mom about this one). From the looks of it, it was a humpback calf about 12 feet long. We didn't stick around for the removal. 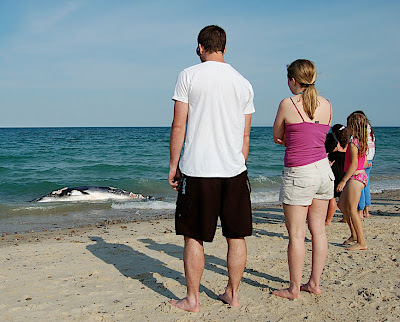 Sad, but it was the first time we all saw a whale up close like that, it was pretty interesting to say the least.